Napoleon is one of the most recognizable historical figures. He had an exciting and complicated career, and we still feel the effects of his actions today. While he certainly had a more direct impact on Europe, he played a role in American history as well. In the earl 1800s, President Jefferson bought the Louisiana Territory from Napoleon’s France. Napoleon understood the value of good PR, well before that term had been invented. When the King of Spain offered a painting’s commission from the talented artist Jacques-Louis David, Napoleon already had an idea. He wanted to be viewed and remembered in a way that I can only describe as epic. 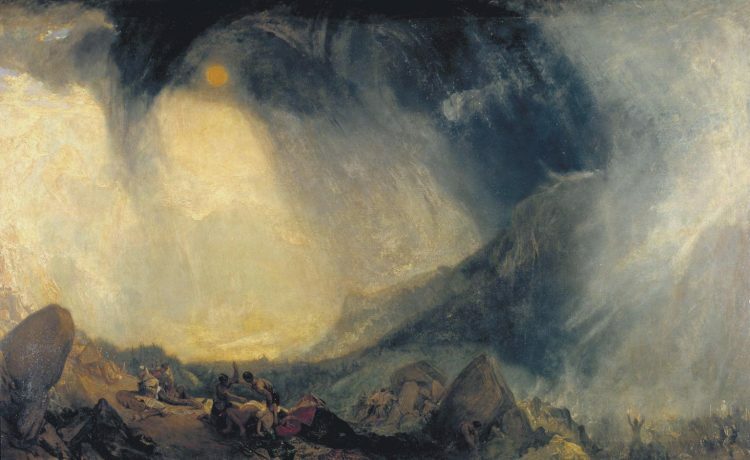 He went with an epic painting that recalled one of his greatest achievements- his passage through the Alps, and the subsequent French victory. He had David paint and frame several versions of the painting, which is why you may have seen this painting with slightly different coloring. And sure enough, I think it worked. For many, this very painting is what they think of when they picture Napoleon: confident, ready, looking strong and ready to plow ahead through the snow and right into battle. But how realistic is this depiction? Probabably not very. Some years later, the painter Paul Delaroche decided to take on this same idea in a different way. 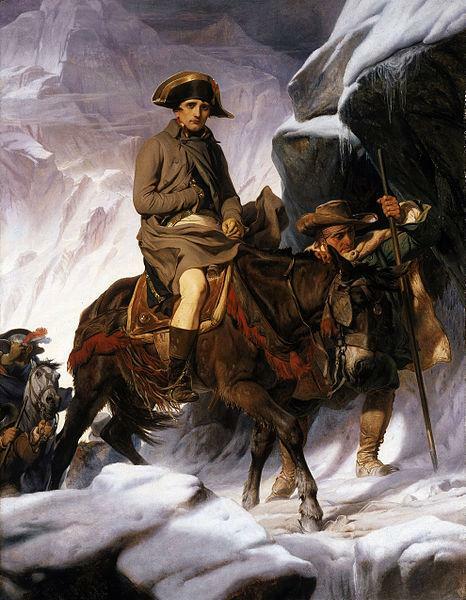 While Napoleon’s crossing of the Alps was a major accomplishment before a major victory, it would not have been like the epic painting shows. Crossing the Alps in the winter is hard and miserable- and perhaps all the more impressive for that. Which is better than the other? There’s no right answer to that question. Each painting had a different purpose, so it’s hard to directly judge one against the other. We also don’t have to. Taken together, they give us a much richer understanding of the crossing. We see both the grim reality of the toil of the march, in Delaroche’s version, yes. 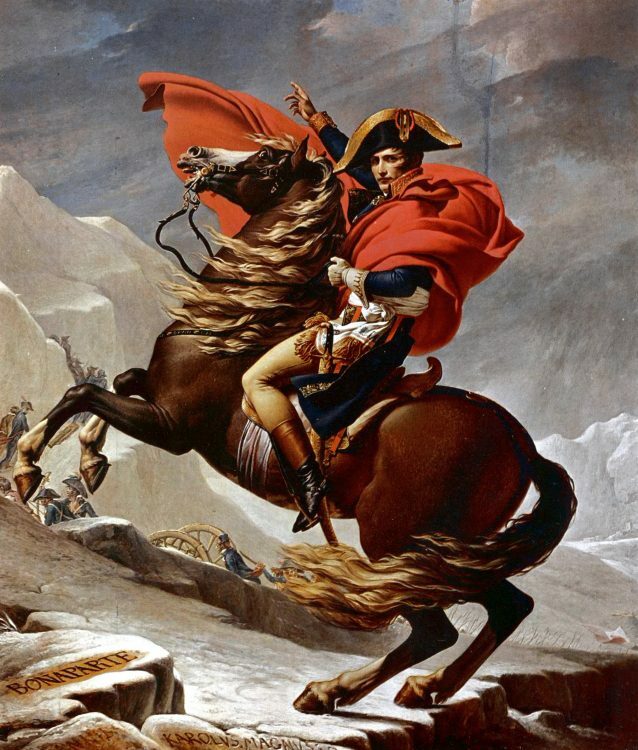 But we also see how it was depicted and viewed at the time- and certainly, to anyone waiting for Napoleon on the other side of the pass, he may have looked more like the the hero astride the great stallion in the brilliant uniform. And of course, we today can choose to mat and display either or both, if we like!